The disk will spin as the modules are loaded and the network card should be auto-detected. The IP address will be fetched from a DHCP server and the Apple II will be ready to transfer files. The Apple II will display its IP address which you will need later with the TFTP client. On your modern computer, you will need to install a TFTP client. Windows 10: You already have a TFTP client, it just has to be enabled. Go to” Control Panel=>Programs=>Turn features on or off” and scroll down to TFTP Client. Enable it by clicking in its box. MacOS: A tftp client is included with MacOS, accessible from the command line. It doesn’t have the extended command line options that atftp has, though. Linux: I have used Advanced TFTP (atftp) with good results. You can install with your Linux package manager of choice. I will use atftp under Linux for my examples as I was using A2Pi for my development machine. The TFTPD server on the Apple II will use the CiderPress ProDOS filename metadata extension so you can set the ProDOS TYPE and AUX values with standard clients. If you set your TFTP client to ‘netascii’ mode, TFTPD will do the conversion of linefeed to carriage-return and vice-versa when copying text files. This only works for MacOS and Linux, Windows uses both carriage-return and newline which doesn’t convert easily. Let’s break this down: The IP address is the address displayed by the Apple II when it started TFTP. The –put option tells atftp that we are sending a file to the server. The ‘-l plasma.system’ gives the local name of the file and the ‘-r /CFFA/PLASMA.SYSTEM#FF2000’ gives the remote file name. Note that we specify the full pathname. It could have been relative to where we started TFTPD on the Apple II, but I like being explicit. Also note the CiderPress meta-data extension to the filename. This will be translated into the ProDOS TYPE and AUX values for the file and removed from the filename on the disk. Here we are copying a text file and converting the line endings to match Linux/MacOS. the ‘–option “mode netascii”‘ sets the text mode translation. The default is ‘octet’ which does no translation. Note that neither sets the ASCII mode. One of the difficulties with TFTP is the inability to do a directory listing. You can’t fetch a list of files from the server, so you will have to know the filenames a-priori. If you do a lot of copying of the same files, it is very handy to create a batch-type file to automate the copies. 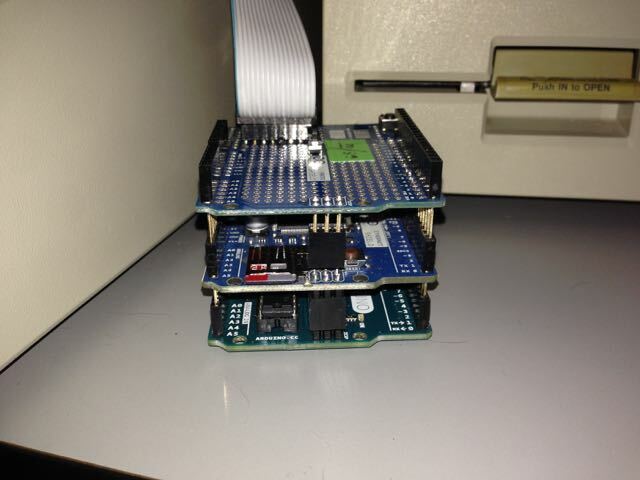 Apple II + Arduino + SD Card + SdFat = A2SdFat! After building the basic framework for interfacing the Apple II to an Arduino over the game port, something useful had to be created with it. I had an Ethernet Shield lying around that also happens to have an SD card slot. There are already plenty of Ethernet products available for the Apple II, but few SD card options for transferring individual files. FloppyEmu, from Big-Mess-O-Wires is a great product and I highly recommend it, but for my project I wanted something closer to a hardware version of CiderPress: the Apple disk image utility. This is the default when using the Ethernet Shield. If you have the Logger Shield, this line should be changed to use 10 instead of 4. If all is in the proper location, you should be able to plug the Arduino into the computer with a USB cable, and build/upload. The current firmware is still a work in process. There are a few more functions to implement, but it is enough to support the software below. There are currently five basic utilities to interact with the files on an SD card. These programs are written in PLASMA, a mid-level programming language developed for writing new applications using modern syntax and efficient execution. You can download a disk image, SDFAT.PO, containing a bootable ProDOS floppy with these programs on it, ready to go. Now you have a chicken and egg problem: getting the image written to an actual floppy will require a program like ADTPro (or maybe a friend can create a floppy for you). That should be all you need to get lots of floppy disk images read and written, as well as copying ProDOS files around. Hopefully, more utilities will be written to provide menu driven and batch mode copy operations, but this is enough to get going. 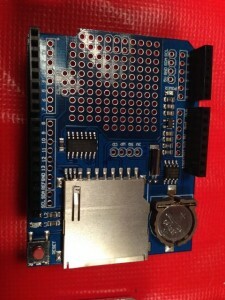 The Arduino/AppleSlave project has been updated to use the SlaveSelect pin on pin 10 and add the RTCLib from AdaFruit. Feel free to leave feedback on the PLASMA GitHub site, or drop me a line. Having received a package in the mail last week containing Andrew and Ivan Hogan’s GamePort I/O Board, it got my creative juices flowing. 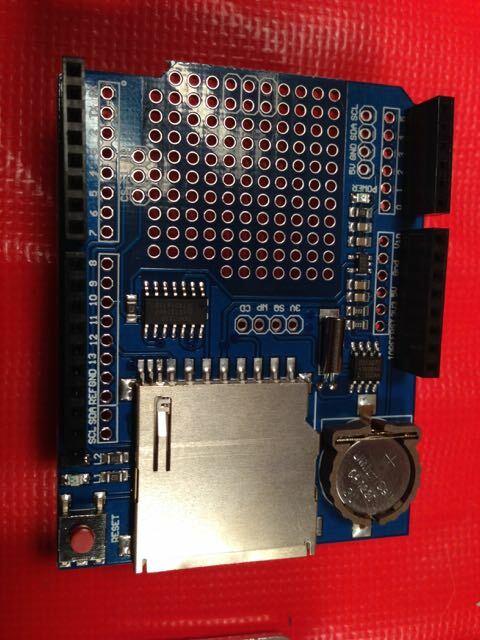 The GamePort I/O Board is a great interface to big, external devices. It’s meant to control things like electronic sprinkler heads, relays, that sort of thing. I wrote a PLASMA sketch to simplify the game port interface, and generally had fun with it. But, as I sat there looking at the game port specification in the Apple II Reference Manual, I noted a utility strobe signal that would produce a 1/2 micro-second pulse when referenced. Hmm. 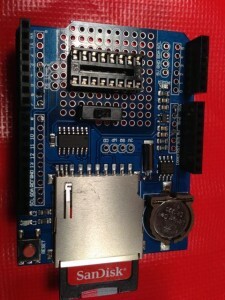 In years past, I had tried building an SPI (Serial Interface Bus) connection using a 6522 and external shift register so I could adapt an Arduino Ethernet Shield to the Apple II. It almost worked, but not quite. And not too long ago, Charles Mangin of Option8 fame had brought up for discussion a method of talking to an Arduino over the Apple II’s game port, and a KansasFest presentation to match. All of this must have sunk into my sub conscience, because I actually had a dream about how to bit-bang an SPI interface from the Apple II to an Arduino over the game port. Why SPI? Well, it is a nicely defined protocol that has some interesting properties. More information can be found on WikiPedia, but it boils down to having a master talking to a slave in a synchronous manner. Data travels both ways: a bit is read as one is written. So you read and write at the same time. Not all data need be relevant, however. SPI doesn’t define a high-level protocol, just a transfer mechanism. And it only requires 4 wires: SlaveSelect, Clock, MasterOut/SlaveIn, and MasterIn/SlaveOut. The Apple II game port isn’t the greatest interface for implementing a fast bit-banged protocol, but it isn’t too bad, either. The master is responsible for the clock, which is where that utility strobe comes in. Along with the strobe, it has 4 general purpose digital outputs and 3 general purpose digital inputs. Programming the outputs is a little strange, and somewhat time consuming on a 6502 if you want to scan out a series of bits. For SPI, only two outputs are needed and one input, if the strobe is used as the clock. This is where the strobe signal really helps out with the bit-banging approach. The clock signal doesn’t have to be symmetrical, the slave just wants to see the edges, and it doesn’t have to adhere to a consistent rate (although I assume most hardware implementations are). So that takes care of the Apple II side of things. What about the Arduino? SPI on the Arduino is officially only supported in master mode. 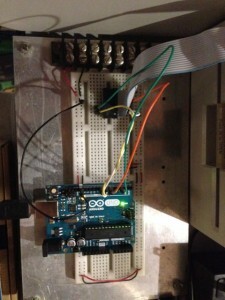 If I was going to bit-bang the interface on the Apple II, why not the Arduino. 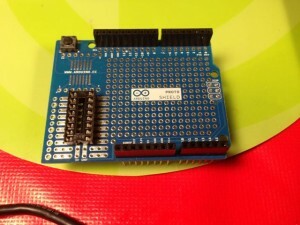 One of my goals was to leave the hardware SPI interface on the Arduino intact so I could use the Arduino as a proxy for the Apple II when talking to the myriad of Arduino shields out there – many of which talk SPI. On top of that, there are some nice libraries that implement higher level interfaces such as TCP/IP and FAT file systems. 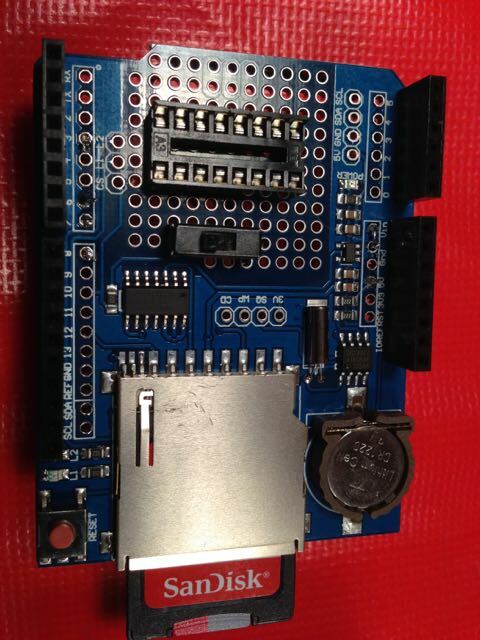 Now the Arduino Uno (well, the ATmega 328P) has some nice features for interfacing to all sorts of things, and the Arduino IDE is a great prototyping environment, so it did’t take long to whip up a connection between the Apple II game port and the digital pins on the Uno. It did take a few iterations to identify the best way to interrupt the 328P when the Apple II was initiating a transaction. Software polling was going to be slow, and potentially miss the quick clock pulses. So I connected the clock signal to an interrupt to make sure I didn’t miss any. However, there was enough potential jitter in servicing the interrupt that bits could get lost. So I ended up interrupting on the assertion of SlaveSelect, and went into a tight loop watching the clock signal and updating the shift registers. Because of the tight constraints during data transmission, I skipped the Wiring library and went straight to the I/O ports on the 328P. 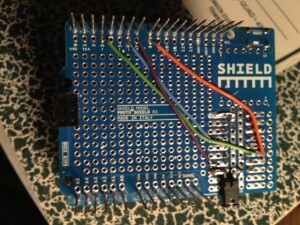 By choosing my pins wisely, it made the software particularly simple to shift data in and out over the wires. Testing out the wiring options was made easier by using a breadboard to connect the game port to the Arduino’s header. Switching the pins around was a matter of moving the wire. 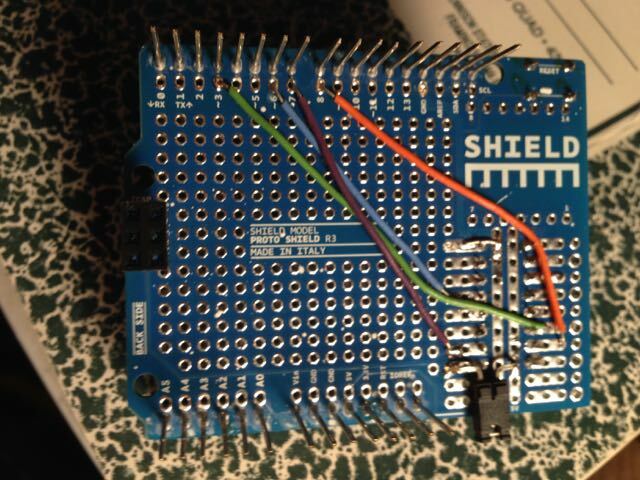 Once I was satisfied the interface was solid, I soldered up my one and only Arduino Proto Shield, which was waiting for just the perfect project to commit to. I soldered the wires to the back to keep it nice and clean. The game port does have a 5V supply, but it is very limited in current: 100mA. A base Arduino without much load should be able to keep under that requirement, but when connected to a host PC for programming, I didn’t want my 5V supplies fighting each other, so I added a jumper for the game port’s 5V. The Arduino site says this isn’t recommended. Yeah, whatever. Finally, it all came together and I ran my test program on it. The LED lights up whenever a key is pressed on the keyboard that has the LSB set, or turns the LED off when it doesn’t. The Arduino’s on-board LED was somewhat covered up by the Proto Shield, so I plugged another one right into the header so you could see it. You can find the Arduino sketch and the PLASMA sketch on GitHub. Going forward, I would like to leverage the FAT filesystem library for SD cards so I can read and write files to and from the Apple II directly from the card. That will greatly simplify my file transfer workflow. PLASMA just got Uthernet IP support. Guess what’s next? Unfortunately, the hardware isn’t without issue. The read operation with auto-increment address appears to drop accesses. The fix is to set the address for every read. This really slows down retrieval of packet data, but it is functional. Writes work as expected. It may be that the implementation is too simplistic: The WIZnet module is wired up directly to the Apple II bus, with the exception the /Read line is the inverted R/W line. 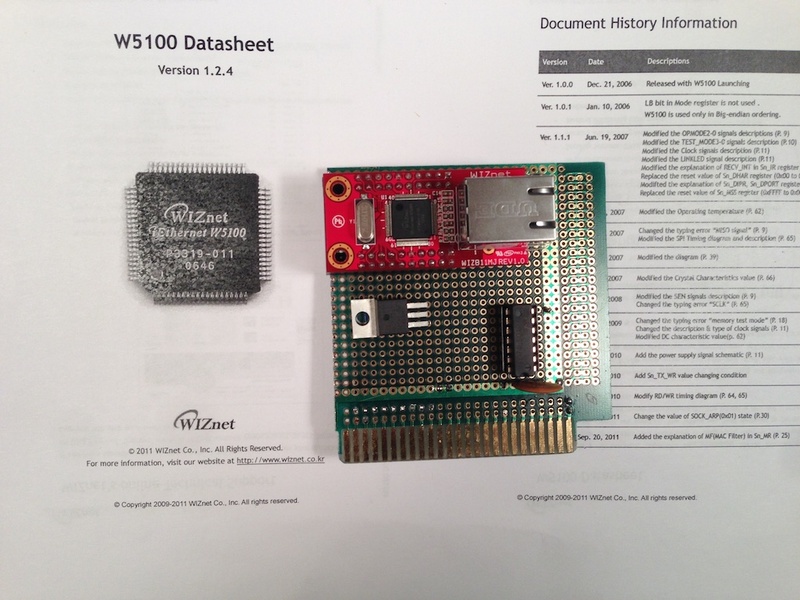 There is a 3.3V regulator for the WIZnet module. Nothing more. I haven’t scoped out the signals to see where the read timing might go wrong. When Apple designed the Super Serial Card back in 1981, they made it compatible with SRAM chips, replacing the ROM it shipped with. Modern EEPROM look just like SRAM chips, with a longer write cycle, so I popped one in, added a write-protect switch, and off I go to debug the Apple II Pi PiDrive ROM code. Rodney’s H/W arrived and it fired right up. 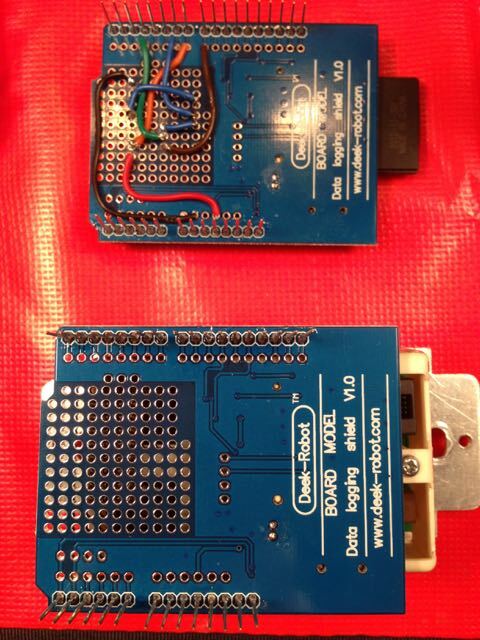 Made some firmware updates, optimized the sketch, and we have a reasonable perky SDCard storage for the Apple II. I re-christened PiDrive to SiDrive: Serial Interface Drive. Check UltimateApple2.com for sales information. Also, check out the forum for support and/or announcements. What is the Apple II Pi? What additional parts are needed to use the Apple II Pi adapter card? Aside from a functional Apple II (64K with 5¼ floppy drive connected to slot 6), you need a Raspberry Pi with an installed OS on its SD card. To attach a DVI or HDMI monitor/TV to the Raspberry Pi, an HDMI angle adapter is needed to redirect the downward facing HDMI port once the Raspberry Pi is attached to the Apple II Pi adapter card. Depending on which slot the Apple II Pi will be plugged in to, a 90 or 270 degree adapter will be needed. An HDMI or HDMI->DVI cable long enough to exit the Apple II case and attach to the monitor/TV is also required. If you don’t have an Apple II mouse, a USB mouse will be required for running the X Window GUI environment. Is a power supply needed with the Apple II Pi adapter card? No. 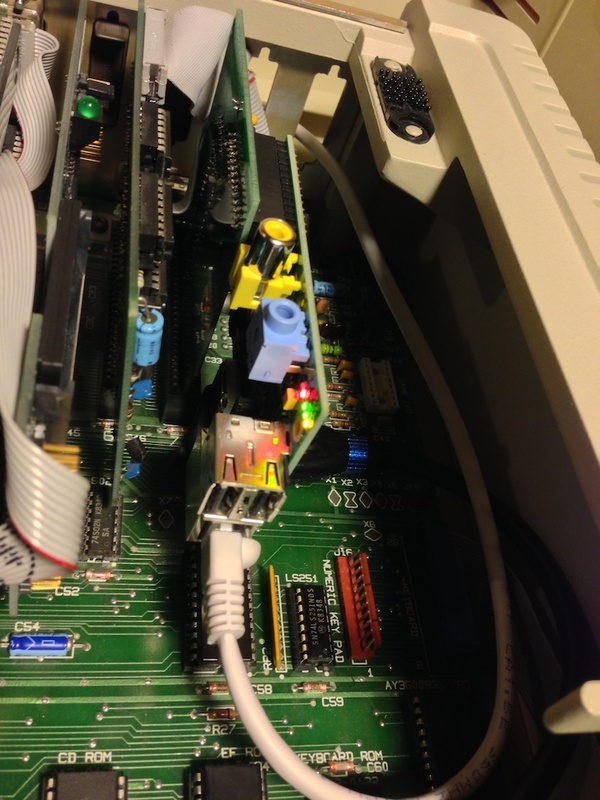 The Raspberry Pi gets power from the Apple II through the adapter card’s header connection. Is the Raspberry Pi talking directly to the Apple II peripherals? 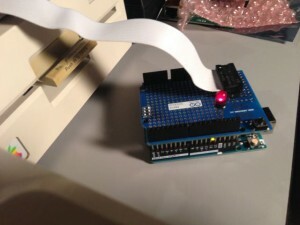 No, the Apple II is running a custom driver that reads input from the keyboard and mouse, then sends these events over a high speed serial connection to a custom driver on the Raspberry Pi that injects them into the Linux input subsystem. The Apple II keyboard and mouse look just like any other keyboard and mouse to the Raspberry Pi. The Apple II joystick and storage devices are made available to Linux with additional drivers that run code on the Apple II using a special Apple II Pi protocol. Additional information: There was talk about interfacing the Raspberry Pi directly to the Apple II bus when this concept was originally posed on comp.sys.apple2. 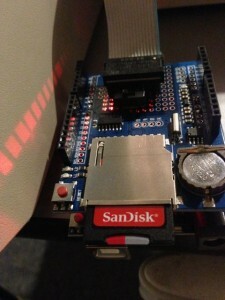 However, after reviewing the I/O pins on the Raspberry Pi and the real-time software challenges of this approach, the decision to interface the two computers using a high-speed serial interface with a custom protocol and client/server drivers was made. This method also allows the Apple IIc and Apple IIe with a Super Serial Card to use the Apple II Pi software without modification. This is, in fact, how the software was developed before and after the Apple II Pi interface adapter was built. Do I have to use the Apple II keyboard and mouse? No, the Raspberry Pi has USB ports (one on the Model A, two on the Model B) that can be used to plug in modern keyboards and mice. Additional devices can be plugged in using a compatible USB hub. They can be used in parallel with the Apple II keyboard and mouse. If you don’t have an Apple II mouse, just plug in a USB mouse, and it will work fine. What monitor do I use with the Apple II Pi? Here you have some options: the default would be to use the HDMI output of the Raspberry Pi to plug into a DVI or HDMI monitor/TV. The composite port of the Raspberry Pi was compromised to allow clearance for the HDMI port. With a hacked up video cable and a soldering iron, you can connect the composite video cable directly to the Raspberry Pi board and plug into a composite monitor. In some cases, it can be useful to have a composite monitor plugged into the Apple II output for running the Apple II Pi configuration program or for developers who want to run code directly on the Apple II (and see it’s output). 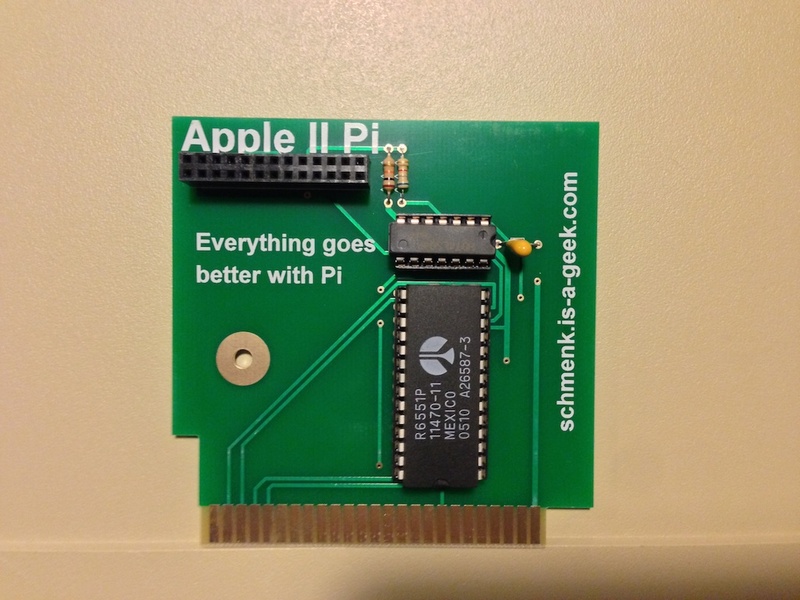 Is the Apple II Pi interface adapter required to run the Apple II Pi software? No, the Apple II Pi software uses the Super Serial Card’s 6551 chip in a special, high-speed mode. 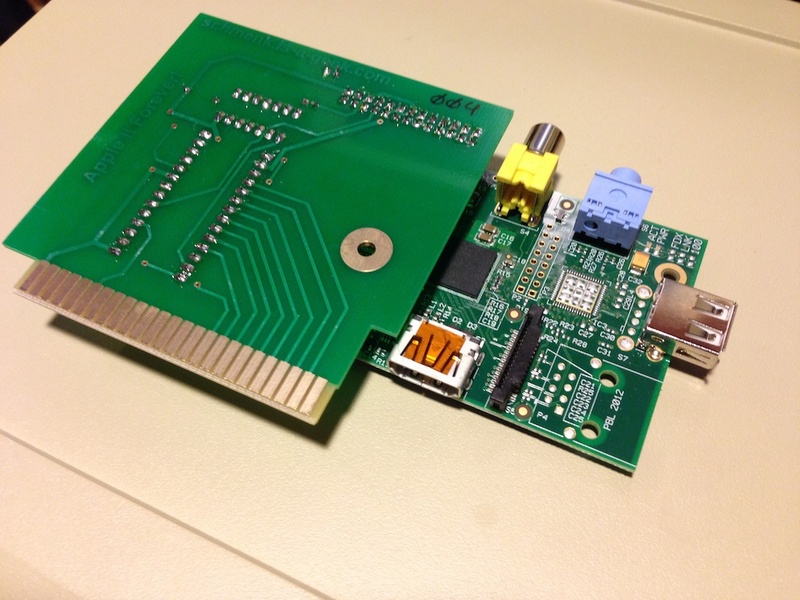 The Apple II Pi adapter card simply has a Raspberry Pi header for connecting the Raspberry Pi to provide the serial port interface and power. 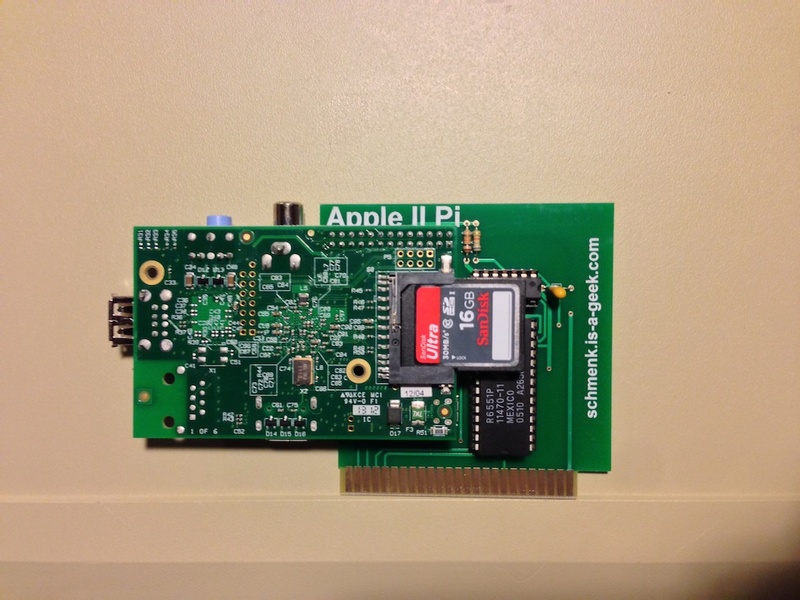 To the Apple II software, the Apple II Pi interface adapter looks like a firmware-less Super Serial Card. 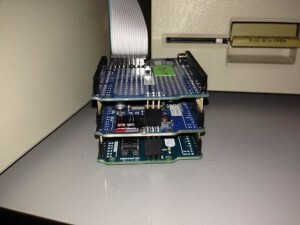 An Apple IIc with a functional serial connection between itself and the Raspberry Pi will work with the Apple II Pi software just fine; some additional parameters may need to be set in the client and/or server software. 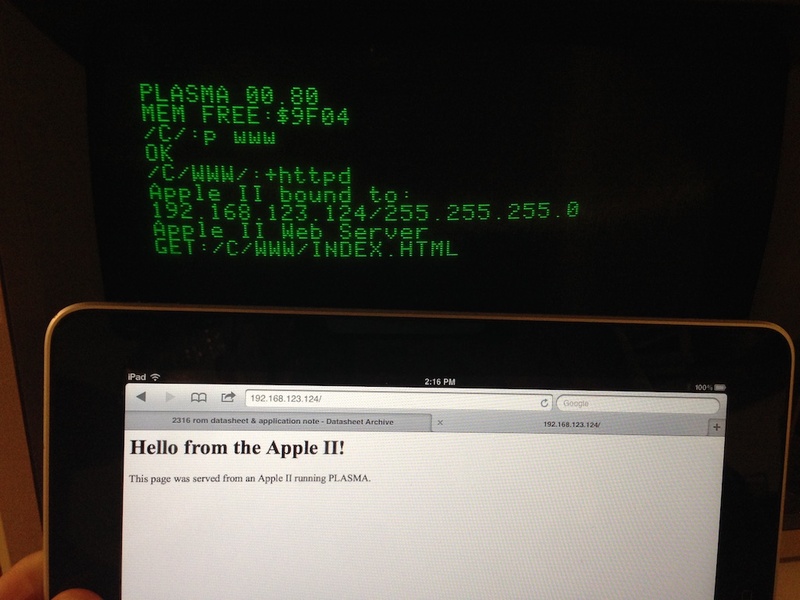 Is the Apple II Pi Open Source? Does the Apple II Pi just accelerate the Apple II? Not in the way a traditional Apple II accelerator would. Because the Raspberry Pi is always running Linux, some configuration has to be made to give the illusion of being an Apple II accelerator through the GSport emulator. But its strength is in bringing modern CPU+GPU hardware and a modern 32 bit OS (Debian Linux) to the Apple II platform. Does the Raspberry Pi provide any services to the Apple II? Update: New functionality has been added to the software that give the Apple II additions ProDOS drives through the PiDrive interface to the Linux daemon. Once a connection has been established between the Apple II and Linux, the Apple II client can exit back to ProDOS and still have the addition virtual PiDrives available for reading & writing. The virtual drive images can be changed from Linux. No, the Apple II is slaved to the Raspberry Pi as a dedicated I/O processor. The Raspberry Pi’s network connection, memory, storage, etc. are not made available to the physical Apple II. 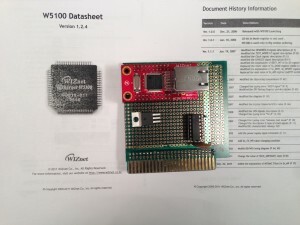 However, the GSport emulator can make use of the Raspberry Pi’s memory and speed, as well as many peripherals attached to the physical Apple II. 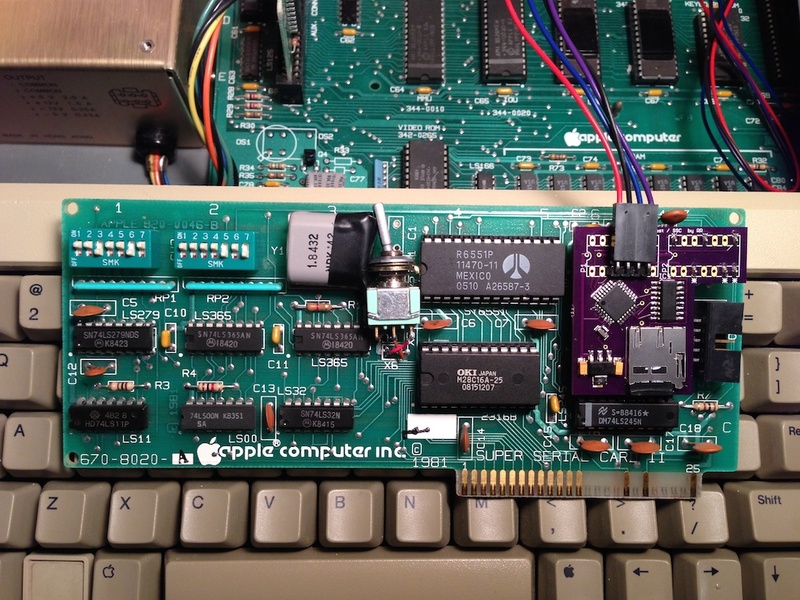 Any USB devices won’t be seen by the physical Apple II, but can be used by the GSport emulator. Does the Apple II provide any services to the Raspberry Pi? Yes, the Apple II is slaved to the the Raspberry Pi as a dedicated I/O processor. Besides the keyboard and mouse input, the Apple II Pi uses a custom protocol that allows Linux applications and drivers to access the Apple II memory and execute arbitrary code on the Apple II. This flexible protocol is how the Linux joystick driver was written and how the FUSE (File system in User SpacE) driver provides ProDOS volumes as Linux directories and files. 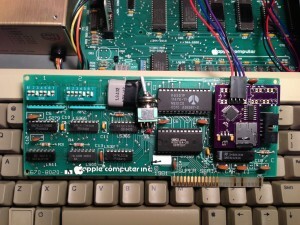 Additionally, some of the provided tools that come along with Apple II Pi allow interacting with AppleSoft BASIC running on the physical Apple II and running arbitrary 6502 binaries on the Apple II. Do I have to learn Linux to use the Apple II Pi? Depending on how your Apple II Pi is configured and how you plan on using it: maybe. Because the Apple II Pi is always running Linux, you will have to interact with it at some level. If your setup is configured to automatically run GSport and then shutdown, there isn’t much you have to learn except logging in. However, the strength of the Apple II Pi lies in the fact it is running Linux, an industrial strength, modern operating system. To use the full capabilities of the Apple II Pi requires interacting with Linux and the X Window System. There are a large number of quality and free applications available for productivity, entertainment, programming, and education. All of them are directly available for download to your Apple II Pi (http://www.debian.org). This spirit of openness is what Woz had in mind when he developed the Apple II in the first place. How do I access my Apple II storage media (floppies, SCSI drive, CFFA, etc.)? By leveraging the FUSE (File system in User SpacE) subsystem, all the ProDOS volumes can be mounted in your user directory. The filenames are munged in a similar manner to the way CiderPress manipulates the names. In addition, the raw devices are available for making full volume copies and usage with emulators. Both floppy drives in slot 6 show up as raw devices regardless of the type of format so that emulators can access non-ProDOS formatted floppy disks. What is the point of the Apple II Pi? To be able to use Apple II hardware in a more modern environment. Although it is possible to use the Apple II as a terminal to a Linux computer, it doesn’t provide much of a modern GUI environment or digital compatibility with flat panel monitor/TVs. Just as GS/OS brought a functional 16-bit GUI to the Apple IIgs (with 8-bit compatibility for Apple II programs), Apple II Pi brings an up-to-date 32-bit GUI and OS to the Apple II (with 8-bit and 16-bit compatibility by way of the GSport emulator). 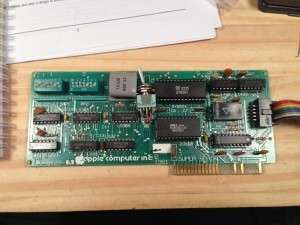 Apple II Pi is a combination of Apple II code, Linux code, and a serial port connection (either cable or optional plug-in card for the Apple IIe). 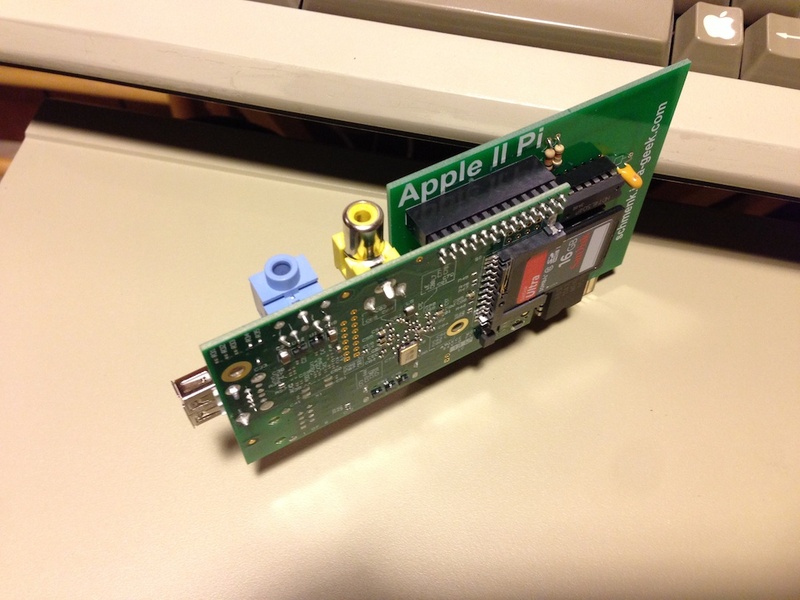 It integrates the Apple II ProDOS world into the Raspbian Linux world of the Raspberry Pi, thus creating Apple II Pi. On the Linux side, the Apple II Pi daemon runs in the background, listening to the Apple II on a serial port connection, listening on TCP/IP port 6502 6551 (so as not to conflict with GSport on port 6502) for Linux client connections, and managing the insertion of Apple II keyboard and mouse events into the Linux input subsytem. It’s not something normally visisble, but is the traffic cop between the Apple II, Linux input events, and Linux client programs that interact with the Apple II. a2pid is responsible for mapping the ASCII characters from the Apple II keyboard into modern scancodes used by the Linux input subsystem. Because of the limited number of keys, the Open-Apple and Solid-Apple keys are used as modifiers to the other keys. Open-Apple is mapped to the ALT key. Solid-Apple is used as a FN modifier key: it alters the arrow keys to HOME, END, PGUP, and PGDN. It also converts the number ksys into F1-F10 equivalents. Solid-Apple+DELETE becomes DEL instead of BACKSPACE. Two special key sequences have a backdoor function for Apple II Pi. Open-Apple+Solid-Apple+DELETE will exit the Apple II client code, returning keyboard control back to the Apple II. If you want to resume interaction with the Linux daemon, you can either press RESET, re-run the A2PI:STARTUP program, or reboot the A2PI floppy. 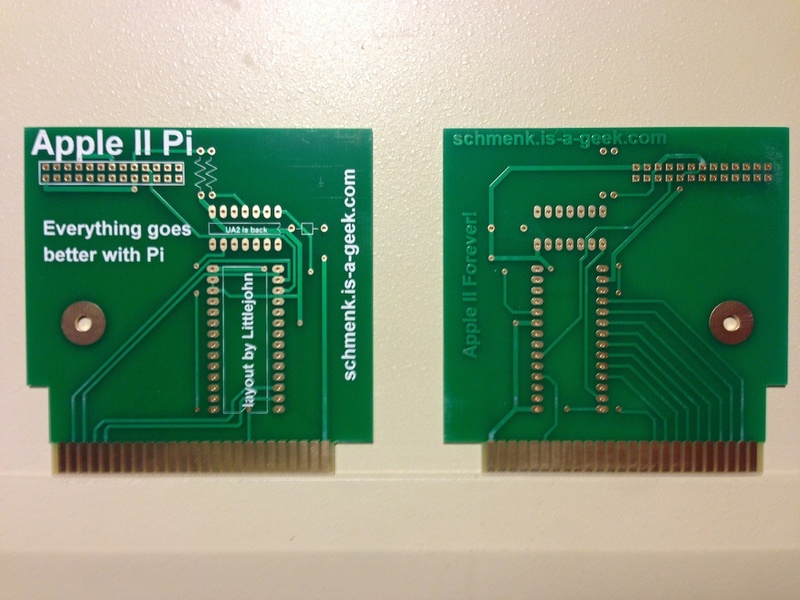 a2serclk is the utility required when using the optional plug-in card for Apple II Pi. Otherwise, it isn’t needed. 3.0 a2serclk is deprecated – it has been integrated into a2pid. The ProDOS disk image file. Inside you will find ProDOS version 1.9, MERLIN8 version 2.59 assembler, BASIC.SYSTEM version 1.5, the STARTUP program that loads the A2PI device driver, and the CONFIG program to configure the slot connection to a2pid. A2PI.S is the source to the device driver developed using the MERLIN8 assembler. The device driver is loaded into the upper ProDOS BASIC buffer space so it won’t interfere with BASIC programs. However, leaving BASIC will disconnect the A2PI driver and keyboard/mouse operations won’t be seen in Linux until STARTUP is re-run from BASIC. The programs that make up the foundation of Apple II Pi should be hidden from sight and “just work”.